The FJ-57 sounds more like an XPrize contestant than a sofa, but a sofa it is. 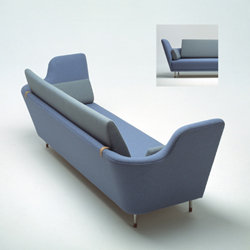 I think the full name is "Sofa Model 57" by Finn Juhl, but FJ-57 seems to be its popular abbreviation. 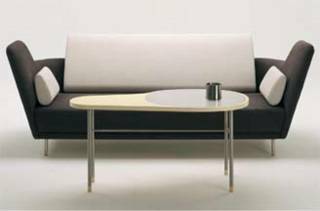 Finn, by the way, was an award-winning furniture creator, architect and a father of sorts to Danish design. I didn't know any of that when I saw the FJ-57, I just thought it looked different and cool. But I can see why he got all those awards. The problem with different and cool sofas is that they often turn out to be uncomfortable and expensive, but the FJ-57 is just fine for everyday sitting and stretching. Part of that is due to the curved back, which makes it easy – inviting even – to sink into. The other part seems to be good design and material. Again, I see why Finn got awards (and lots of them). The FJ-57 isn't super funky looking, but it's well suited to a two-tone look that can add a bit of dash if you’re looking for it. Finn really thought this one through. it looks too angular to be inviting to me. i'd prefer something that both looks and feels soft to lie down on. As cool as it looks, how comftorable can it be? I guess comfort isn't that important to some. hehe. It also seems like those high wings on the sides would limit visibility with other folks sitting nearby in a conversation. The FJ-57 is awesome, where can i get it? The question is...Can a 6'1" man lay down flat on it and take a nap with out having his feet curled up under him or hanging off the end? That alone might make it worth the price. I think that most women would hope that this sofa NOT be good for male catnaps. Who wants to see someone hog a whole sofa? Beds are for sleeping.